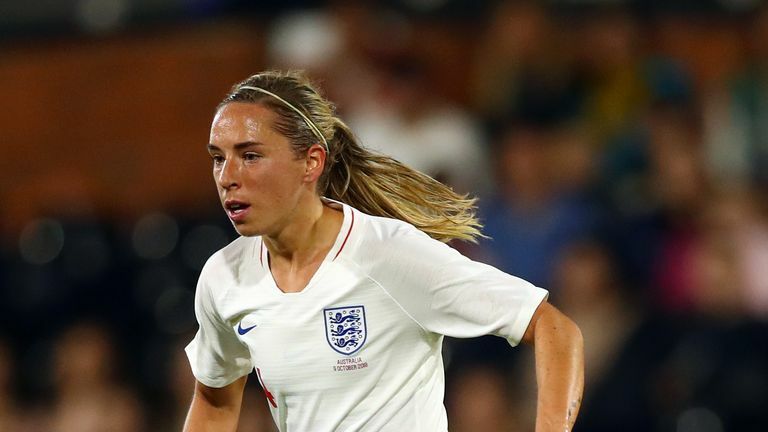 England's Jordan Nobbs has told Sky Sports News she hopes to have an impact from the sidelines at the World Cup, despite injury ruling her out of this year's tournament in France. Nobbs is recovering from a serious knee injury, having torn her anterior cruciate ligament during Arsenal's Women's Super League victory against Everton in November. The Arsenal midfielder has been ruled out of a second successive World Cup, but speaking on Sportswomen, Nobbs says she is still hoping her presence will have an impact at the tournament. The 26-year-old said: "I want to be as part of the team as I can, and the staff and the players have given me that support and that open door to be at the camp. "I'm going to the next camp for a few days for rehab and to be around the team. I'm very privileged to still be involved and if I can play a one per cent part in helping the girls be more positive and mentally stronger, then hopefully I can be a good role model and give gains to any of the players." Nobbs has been recovering with her Arsenal and England team-mates, while sharing pictures on social media to keep fans up-to-date with her progress. "I'm three months down the line and I'm allowed to start jogging soon, so that's a big milestone for me, but it's been very tough," she added. "I'm in a better place now and hopefully I can come back fitter and stronger." England Women's head coach Phil Neville has been particularly supportive throughout the midfielder's rehabilitation, having found a novel solution to keeping his vice-captain focused. "Phil's been a massive part of the mental stage of my recovery and I'm very grateful for the lego set that he sent," Nobbs said. "He's going to kill me for telling everyone now! He's seen that me and another team-mate in the treatment room have been doing a lego set. "He obviously sent that to say, you've got a lot of time out, take your focus on anything else."